Traveling by air is hectic and more complicated than it used to be -- and if you travel on holiday weekends, you can add even more stress and uncertainty to the travel experience. Phoenix Sky Harbor International Airport is one of the busiest airports in the U.S., so you can assume that just before holidays like Thanksgiving, Christmas, and any other day where many American have a three or four day weekend, this airport will be a challenge to navigate. Here are some tips to help you get your holiday trip off to a pleasant start. It's recommended that travelers always arrive at least two hours before a domestic flight, and at least three for an international one. If you are planning to drive and park, either at the airport or off property, make sure to leave plenty of time in case you have to drive to more than one lot to find space. Before leaving home, check with your airline on possible flight delays and baggage weight limits. Call the Sky Harbor 24 hour parking hotline for up-to-the-minute information on available space. If the standard economy lots fill up, the overflow lots will be opened, however, passengers are advised not to travel to the overflow lots unless directed there by signage or airport staff. In order to encourage people to use the terminal garages during the holidays, Sky Harbor sometimes offers coupons -- as much as up to 40% off. Or, consider parking at an off-airport facility. Have a backup plan (along with directions and a phone number) in case your original lot choice is full. Your best bet is to have someone drop you off and pick you up from the airport. If that's not possible, consider taking a taxi, limousine or shared-ride van service. Make sure you check on the current TSA rules and regulations for carry-ons as well as checked baggage. You don't want to be delayed at the airport or fined by TSA because you are carrying a prohibited item. When you get to the airport, check any bags, get your boarding pass, and go through security. Sometimes the long lines at Sky Harbor security checkpoints can't be seen from the main part of the terminal, and if you spend too much time eating, drinking, or shopping, you might leave yourself without enough time to get through security screening. There are places to buy food, drinks, newspapers, and books in the gate areas. At Terminal 4 there are four security gates, A, B, C & D. Your boarding pass indicates the closest gate for your flight. 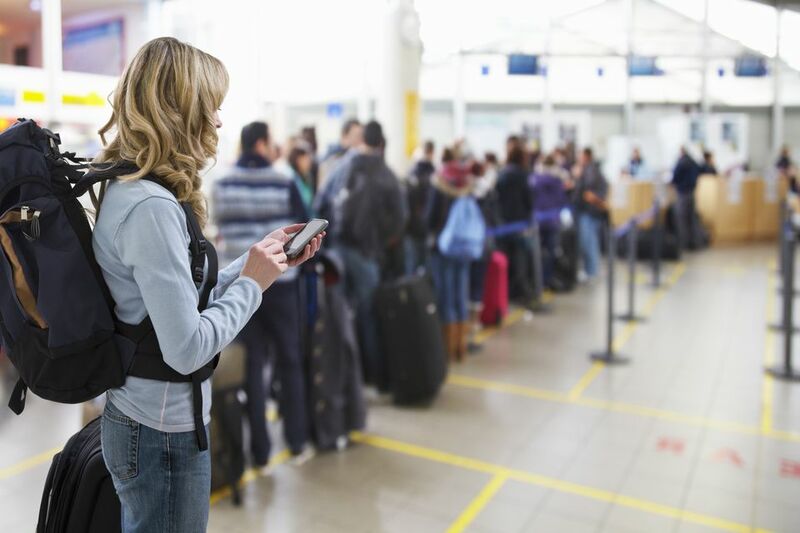 If the security line looks very long at your security checkpoint, and you are worried that you might miss your flight, consider another security checkpoint. All gates at Terminal 4 are connected by walkways, some of which move. You might have to walk farther if you use a different security checkpoint, but it might save you time if you can easily walk. Note that the walk between checkpoints A and D are the farthest from each other. A final tip: Do not bring wrapped gifts in either your carry-on luggage or checked bags -- screeners may have to unwrap them. Remember to put identification tags inside baggage as well as outside in case your tag comes off. It's not just suitcases and carry-ons that should be tagged -- laptops, cell phones, and other electronics should have identification on them. When picking up passengers at the curb, wait in the free Cell Phone Lot lot on the west side of the airport, until your party comes out to the curb. If you parked at the airport in one of the Economy Lots, consider using Credit Card Express to make your return and trip home a little faster. When you park in either Sky Harbor's East Economy A or B garage, take your ticket with you. When you return you can pay for your parking at an easy-to-use kiosk in the elevator lobby. Then you'll be able to exit the parking garage through a dedicated lane for Credit Card Express customers so that you don't have to wait at a toll both behind other vehicles waiting to pay.